Kasarinlan is under the Journal Incentive Program of the Commission on Higher Education (CHED), receiving a Journal Incubator grant, which aims to support "promising Philippine journals towards the path to meet the minimum generally accepted standars for Scopus/WoS-indexability" (CHED Memorandum Order 53, Series of 2016). Under the previous CHED journal accreditation program from 2009 to 2015, Kasarinlan maintained a Category A-2 (very good to excellent) rating. 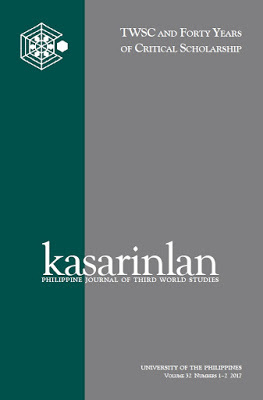 Kasarinlan: Philippine Journal of Third World Studies accepts article submissions for its future open issues. There is no deadline for submission of articles. Interested authors may make their submission any time of the year.